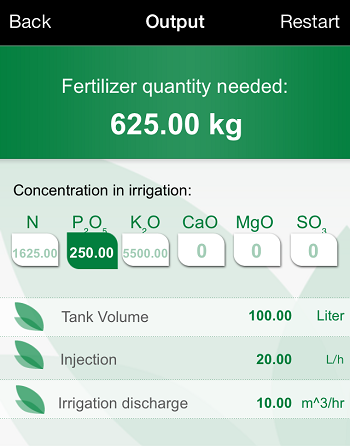 The FertiMatch™ app helps the grower carry out Nutrigation™ (fertigation) calculations by determining the right amount of fertilizers needed for a desired composition. 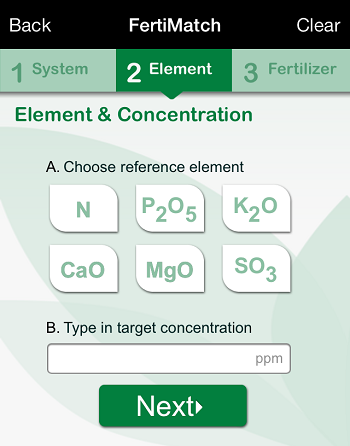 With input that includes data about the fertigation control head, choice of reference element and fertilizers in use, FertiMatch™ is a fertilizer calculator that will tell you how much of each fertilizer you have to add to the tank to get exactly what your crop needs. No more hassle in fertigation calcultions. Get the required figure in 3 easy steps. Dynamic settings: Metric / US / Imperial; Oxide / Elemental; ppm / mmol and more. No internet access is required.